Summer and coffee. Now, those are a couple of things that I can get excited about! I am participating in the Summer Coffee Lovers Blog Hop while sipping my peanut butter cookie flavored iced coffee this morning! If you would like to participate, you still can! 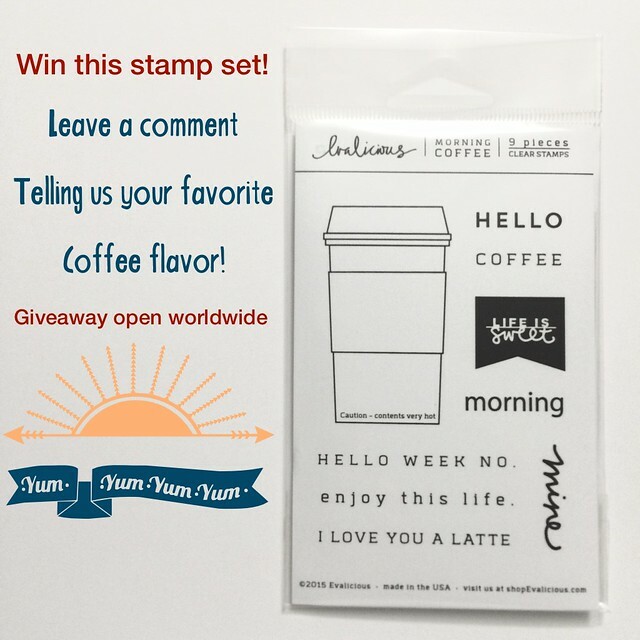 Simply create a summer AND coffee themed project and link it up on the Summer Coffee Lovers Blog Hop post! There are LOTS of awesome sponsors and prizes for entering AND for commenting! SO much fun going on! I recently bought these adorable flamingo dies and thought they would be a perfect fit for the summer theme! I combine them with the MFT Coffee Cup Die set to create this fun card. The sentiment is half from the Tickled Pink stamp set and half computer printed. I accented the flamingo with white colored pencil to add some dimension. The Bazzill Kraft Foil paper made the PERFECT little coffee cup sleeve! Seriously. I love that part. I really do. I have a little giveaway to share with you today, too! Simply leave a comment on THIS BLOG POST by 12 June 2015 for your chance to win! What a FUN card! Pink famingos and coffee together...brilliant! Love that fun sentiment, too! What a generous giveaway, too -- my favorite flavor of coffee is regular old Maxwell House Master Blend with lots of milk and some sugar! LOVE this, Jen! The flamingo is awesome! This card!!! Totally fabulous : D. My favorite coffee is regular (no other flavor added) coffee, black, no sugar (maybe an ice cube to cool it down fast). Love the stamp set, thanks for the chance to win it! love the white pencil accent on the flamingo. cute card. love a skinny mocha every now and then! Everything about this card works perfectly!!! The sentiment, image and colors! Wow! This, all of this, only this, MORE of this! Wowzers, this is gorgeous! Love the flamingo on the coffee cup! Thanks for the giveaway! As for my favourite coffee flavour, I had to give up coffee due to sleep troubles, but my favourite tea is chocolate chai! Simply awesome design, Jingle...I love that flamingo! So adorable.. I love that flamingo.. You can never have too many flamingo"s or too much coffee!!! OMGosh. I love flamingos and your card is fantastic! Love how you did the sentiment and the colors!! Perfect summer card!! Very cool! I like how you incorporated the flamingo into the design. Ah! I love this! & that sentiment is perfect!! Wow,a fabulous creation! The colors matched perfect together,love this color combi. The beautiful flamingo gives a little bit exotic to the coffee,that´s lovely,yeah!!! This is a perfect card for the theme! Love the flamingo. I only drink cold coffee drinks and my favorite is a Mocha Frappuccino. Cute card! Coffee definitely helps...I can't adult without it. :) My go to is and iced caramel coffee with chocolate sauce mixed in. SOOOO yummy! I think this is one of my very favorite from the entire hop so far! LOVE that pretty pink flamingo! Beautiful card! And nothing too fancy here, I just like a good ol' mocha. Too cute! I guess my favorite coffee is vanilla latte! I love that you added your own bit to the sentiment. And the flamingo? Super cute addition. cute card and great stamp set. how generous of you! i love lattes. almost any flavor! I love flamingos and this card is the bomb! My favorite coffee is Colombian. And I do love the Creamery and Hazelnut creamers with it. This is so seriously cute!! I love that you added a flamingo to the card! Love it, should be a new taste: Falmingo Coffee (with some liqour in it!!). I love that flamingo! Such a great card! Such a fun card with the flamingo! I have the flamingo dies on order...love them! :-) Wonderful coffee cup, too! I will put that on my wish list! Thanks so much for the awesome inspiration! My favorite coffee blend at home is regular Maxwell house mixed with French Vanilla...yummm! Thanks for the blog candy offer. My favorite coffee flavor is Baily's Irish Crème in any coffee! What a great card! I love the flamingo on the logo! The colors are perfect and so is the sentiment! My favorite coffee is Pumpkin Spice! Love your summery card! Your drink sounds wonderful, too! My favorite flavor is Newman's Special Decaf in my Keurig with a lot of chocolate syrup! 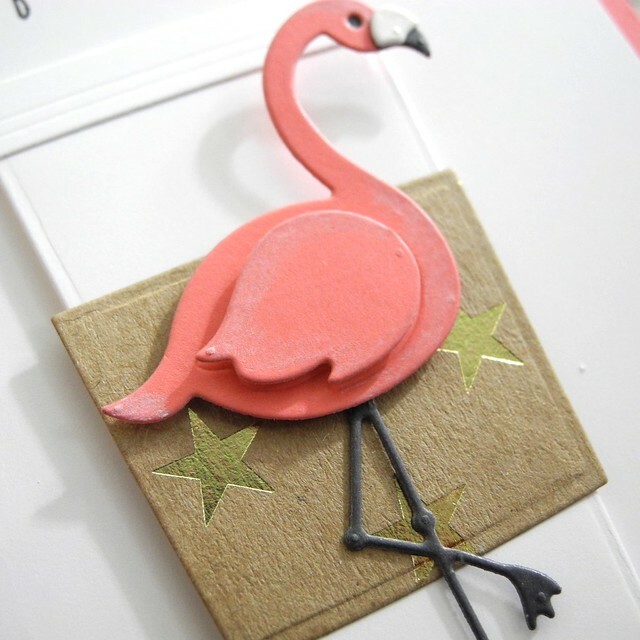 What a lovely card, Jingle, I love your flamingo...how summer can you get? Happy hopping! absolately love everything about this card! The sentiment is awesome and the flamingo is such a fun addition! How creative to put a flamingo on a latte cup! Love your creative mind! I really love caramel flavored frappuccinos! Love your card! Nice touch to add the little bit of white to the flamingo! AWK!!! Love that flamingo paired with the coffee die cut! The highlighting on the flamingo gives a subtle dimension that looks even more fabulous! My favorite coffee flavor is french vanilla with half and half! YUM! I love your card♥ My favorite is Hazelnut (No cream or sugar and 2nd is caramel frappes! OMG....my two favorite things in the world (well besides my hubby and grandchildren) are coffee and flamingos and you put them both on a card. YOU ARE A FRIGGIN' GENIUS!! I think I just might have to copy your idea for a PL card if you wouldn't mind. I will totally give you all the credit. I love your card in case you did not know. Awesome prize too....gotta love Evalicious. My favorite coffee flavor is hands down mocha.....yum. Coffee and a flamingo?!!! What's not to love about that? So cute! My favorite flavor is mocha, but if I had peanut butter cookie available that might change things. Where do you get your coffee that you have such awesome flavors all the time? I adore everything about this card. This has to be the cutest way I have seen those flamingoes used. What a fantastic card! That coffee mug is awesome and the flamingo is simply fabulous! This looks fantastic!! Love the flamingo with the coffee mug, brilliant idea and coloured beautifully! My favorite flavor of coffee is ... coffee, lol. However I loved the Pumpkin Frappaccino that came out from Starbucks last winter. Yummy! Too bad it's only seasonal. Loved your fabulous card. Well done. Oh what an awesome card!! Love the flamingo!! Thanks for the give-away! My favorite flavor is white mocha! How cute!! I LOVE that pink flamingo on your card. Very cool design!! I'm with you, I love the gold stars on the coffee sleeve, and the sentiment is adorable. As always an amazing card I just love this!!! Flamings and coffee...who knew they'd pair so well together! You, obviously! Love this! Fabulous card ( you got that right) ~ French Vanilla fave coffee!!! I LOVE this! The flamingo rocks! It is a gorgeous card! Cracking card - I love your clean cut style! Oh My.... Love that flamingo! What an awesome card! Oh my gosh - this is such a fun card! I'm totally a mocha or salted caramel girl! Jings, I'm not commenting to win the set, although I love it, and you for offering, but, to say how adorbs is Mr. flamingo, and I wish I had that die so I could create something as perfectly striking as you've done! Seriously lights up the lineup!!! what a fun card, Jingle! Nothing says summer like a flamingo! Great card! Thanks for sharing! love it Jingle, so very fun! The flamingo is a nice touch! Fabulous card! Love that flamingo. I just love coffee, just coffee. Oh my gosh - this is such a fun card! LOVE the flamingo and what a great idea...love this! 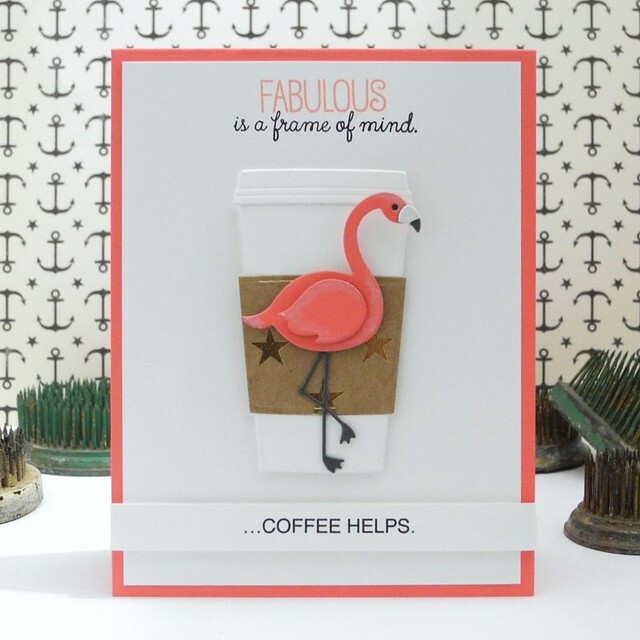 Love the combination of a fab flamingo and coffee cup die cut! On most days I love the Island Coconut flavor for my Keurig. You paired the coffee mug with flamingo so beautifully, a perfect summer creation! I am a tea lover and an Indian Masala Tea is my favorite! Oh my goodness! This is just perfect! The addition to the sentiment is genius and this is truly the perfect summer coffee card! What a fabulous coffee card and I love that flamingo! My favorite coffe sadly has to be decaffeinated these days! such a fun card! I love that coffee sleeve with the stars on it. Great summery coffee card with that fabulous flamingo! Love the flamingo on the cup! Such a fab card, Jingle! My favorite is Hazelnut. Thanks! Absolutely GORGEOUS!! My favorite coffee flavor would be Dunkin Donuts Ice Coffee.. any flavor..YUMMO!! Oh gosh wouldn't it be fun to order a coffee and receive a cup decorated like this???! LOVE that pink flamingo and I totally agree with the sentiment. Thanks so much for stopping by my blog too and leaving some love! What a marvelous card. I love the flamingo. So fun and unique. love the sentiment...perfectly paired with the flamingo! Coffee & Cream, that's all I want. Adorable! love the CAS look! Nothing says summer like pink flamingos! Thanks for sharing and the chance to win. Oh I wish I had thought to put a flamingo on a coffee cup!! I sure would have done that! I love love this!!! The sentiment is SO perfect too! My favorite card of the whole hop!! Love the flamingo! So summer! LOVE...LOVE this card! So fun and so clever too! Cute card! Love the coffee cup and the flamingo is a perfect addition. My favorite coffee flavor? Well, it's a toss between peppermint and french vanilla. loving the flamingo, cute card! Wow! Beautiful! Love the flamingo! Gorgeous! That flamingo is awesome sauce, and the sentiment is really fun! I'll take Caramel Swirl in my coffee pleeeeze. My favorite flavor of coffee is itself. fresh ground and brewed coffee. I am actually not a coffee drinker but I live the Strawberry drunk at Starbucks!!! love, love, love the flamingo die and great idea to add it to the coffee cup. My favorite coffee flavor is caramel vanilla. Jingle ... this is the sweetest, most CAS delightful card here on page one... just sayin' - what? No sucking up - I mean every syllable! Hmmm favorite? I'm going Hazelnut with extra cream. Oh this card is fabulous and I love the sentiment you created with it. Great giveaway, in those cups, I would have to say a skinny latte, if it's on ice, than with vanilla. Oh wow! One of my fave cards of this hop! Love it! My fave coffee is Chocolate Raspberry truffle, soooo good! Blessings! Awesome card! Love the flamingo--cute element! Fantastic Card!!! My favourite flavour is vanilla coffee!!! TFS!! !